The attorneys at our law firm have more than 100 years of combined experience, and they put their experience to work for each of our law firm's clients. In addition to their experience, we have a network of experts upon whom we call for assistance with our cases. These experts include accident reconstructionists, toxicologists, physicians and forensic engineers. With their help and our knowledge of Florida law, no case is too complex for our legal team. If you or someone you love sustained an injury due to an auto accident, workplace accident or other act of negligence, you can call on the dedicated attorneys at the law firm of Shapiro, Goldman, Babboni & Walsh for help. To ensure that our services are available to all of those in need, we proudly offer free initial consultations at our Arcadia law office to all prospective clients. 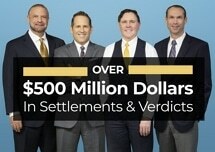 The lawyers of Shapiro, Goldman, Babboni & Walsh have more than 100 years of combined Florida legal experience in personal injury, wrongful death and negligence cases. An auto accident can happen to anyone. Every year, car crashes cause death and brain, head, neck, spinal cord, shoulder, knee and other injuries to millions of people. If you or a family member has suffered a wrongful death or a head, brain, neck, spinal cord, shoulder or neck injury after a truck accident, Shapiro, Goldman, Babboni, & Walsh is prepared to help you seek justice. Motorcycle accidents can be even more devastating than car or truck accidents, injuries and damage more extensive. Shapiro, Goldman, Babboni & Walsh helps the families of people who have been in fatal accidents or have sustained brain, head, neck, spinal cord, shoulder or knee injuries due to the negligence of others.